Z Puppets is proud to have received numerous awards, including the ones listed below. The Sally Awards recognize and celebrate the contributions and accomplishments of artists, educators, volunteers, philanthropists, and leaders who strengthen and enrich the stage of Minnesota with their commitment to the arts and arts education. Learn more about the Sally Awards here. 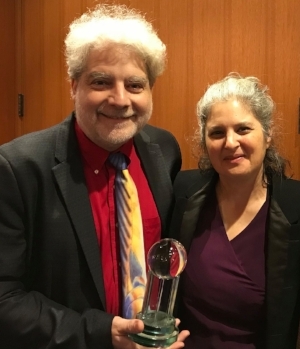 Z Puppets Rosenschnoz has received an award from the Rimon: the MN Jewish Arts Council to create and premiere a new show rooted in the family lineage of exodus from Jewish and Cherokee history of Creative Directors Shari Aronson and Chris Griffith. Tabletop Exodus will feature suitcases as miniature stages for epic tales that redefine diaspora for the 21st century. The production will combine puppetry, physical comedy and audience participation, with live music by multi-instrumentalist world music expert Greg Herriges. Tabletop Exodus will premiere in Spring 2019. Backus Community Center will partner with award winning artists of Z Puppets Rosenschnoz for a five day Monkey Mind Pirates arts and mindfulness camp culminating in a public performance featuring Backus youth. The New York Mills Cultural Center will collaborate with Z Puppets to conduct workshops focusing on movement and music for elementary school students that will culminate in a public performance incorporating the students as actors. The City of Maplewood will work with Z Puppets Rosenschnoz to continue building Kid City, a Parks program for youth ages nine to thirteen, to learn theater skills that will spark cross-cultural connections and positively impact their city. Austin Area Commission for the Arts will present Z Puppets' STEAM of Puppetry workshops and performances at three community sites to increase access to arts programming for Mower County youth. Moreland Arts and Health Sciences Magnet School will expand Z Puppets' Monkey Mind Pirates arts and mindfulness K-2 and special education residency to include teacher integration coaching. Moreland Arts & Health Sciences Magnet School will expand Z Puppets’ Monkey Mind Pirates arts and mindfulness program by integrating Mayo Clinic science curriculum and adding special education residencies. Z Puppets Rosenschnoz will expand a partnership with Epic Enterprise to lead adults with special needs in eight arts and mindfulness workshops and four public performances of the puppet, rock, and yoga adventure, Monkey Mind Pirates. Midwest Special Services participants will explore the world of puppetry with Z Puppets Rosenschnoz. The program will conclude with three live multimedia puppet shows. Autism Society of Minnesota will partner with Z Puppets Rosenschnoz to expand sensory-friendly arts and mindfulness programming to the Twin Cities’ eastern suburbs, with outreach to previously underserved families. The City of Maplewood will work with Z Puppets Rosenschnoz to launch Kid City, creative task forces of ten- to twelve-year-olds that will learn how to use clowning, puppetry, and improvisation to bring diverse cultural communities together. Puppetry artist Chris Griffith and collaborator Shari Aronson will collaborate with Stillwater Public Library and Valley Friendship Club for Z Puppets science, technology, engineering and math performances and workshops. Moreland Arts and Health Sciences Magnet School in Saint Paul and Z Puppets will expand successful arts and mindfulness residencies, family workshops, and professional development to add after-school and summer programs. The Autism Society of Minnesota will collaborate with Z Puppets Rosenschnoz to bring Monkey Mind Pirates arts and mindfulness programs to youth and families living with autism in Twin Cities, Duluth, and Rochester. The Institute for Health and Healing will work with Z Puppets to provide multidisciplinary arts and mindfulness residencies for two groups: children of patients with serious illness and families living with autism. Puppeteers Shari Aronson and Chris Griffith will partner with Duluth Children's Museum to present a series of free puppetry workshops and performances, using the arts to engage families in science, technology, engineering, and math. In partnership with Northern Clay Center, Z Puppets Rosenschnoz, and independent visual artist Lori Brink, Epic Enterprise will provide arts learning and arts appreciation opportunities for adults with developmental disabilities. Moreland Arts & Health Sciences Magnet School will bring Monkey Mind Pirates, Z Puppets' arts and mindfulness initiative integrating puppetry, music, and yoga, to K-4 students, teachers, and parents in spring/fall 2014. In partnership with Kairos Dance Theatre, Z Puppets Rosenschnoz, and visual artist Lori Brink, Epic Enterprise will provide arts learning and arts appreciation opportunities for adults with developmental disabilities. Moreland Magnet School will bring in Monkey Mind Pirates by Z Puppets; arts and mindfulness residencies, workshops, and performances that integrate puppetry, music, and yoga for K-4 students, teachers, and parents, in spring 2013 and fall 2014. Z Puppets Rosenschnoz will tour Cellula, a glow in the dark, sensory­ friendly performance of mitosis and outreach to engage family audiences in the STEAM of Puppetry at 6 Greater MN venues. Z Puppets Rosenschnoz will partner with New London's Arts Alliance and Duluth's Sacred Heart Music Center to tour four sensory-friendly performances and sixteen participatory outreach events combining puppetry and music for families. Puppeteer Aronson and collaborators will tour Z Puppets Monkey Mind Pirates performances and workshops to sixteen northern Minnesota sites in summer 2013, integrating puppetry, music, and yoga to give families creative tools for finding calm. Mankato Family YMCA will present Z Puppets Rosenschnoz's Monkey Mind Pirates workshops and performances, giving children in our Brother/Sister program arts experiences focused on stress reduction. American Indian Family Center will produce a series of workshops and performances with Z Puppets Rosenschnoz to give students and their families an arts experience focused on mindfulness-based stress reduction. To expand Cellula, a glow in the dark performance of mitosis into a full-length show about cell science through structured experimentation with collaborators, advisors and neighborhood youth. To create and tour The Gnip Gnopera, a blacklight opera of ping pong balls. To develop the tools to get her existing repertoire of family-friendly puppetry shows out to new audiences across Minnesota by working with a videographer to professionalize her video documentation and for a business coach. To create an original children’s puppet show titled “The Puggles: Platypus Investigators” (PPI), and subsequently tour the production across Minnesota. The project will support his transition from artistic director of Galumph Interactive Theater to an independent artist. For creating Cellula, an blacklight story of mitosis. For creating The Puggles: A Platypus Adventure. Kid City programming at Maplewood Summer Parks. Kid City Teen Video project: a partnership with the City of Maplewood to hire and train teenagers in video production. Happy Places, a partnership with the Tubman Center, to create toy theater puppet shows with youth and families. Tabletop Exodus: Z Puppets Rosenschnoz will create and premiere a new show rooted in the family lineage of exodus from Jewish and Cherokee history of Creative Directors Shari Aronson and Chris Griffith. Cellula, a blacklight story of mitosis. The Puggles, a Platypus Adventure. Chris Griffith, for design and creation of puppets for Hershel and the Hannukah Goblins, MN Jewish Theatre. 2009, for The Puggles: A Platypus Adventure.